Costa Rica is considered one of the happiest places on Earth, how did this happen? 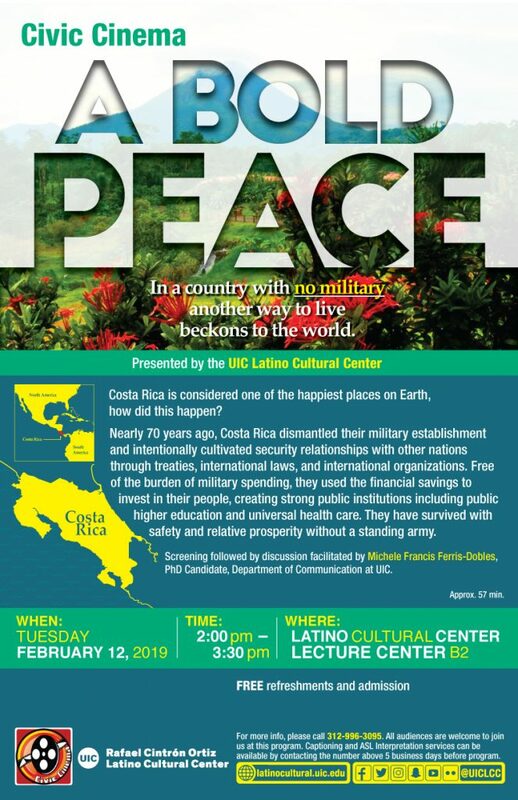 Nearly 70 years ago, Costa Rica dismantled their military establishment and intentionally cultivated security relationships with other nations through treaties, international laws, and international organizations. Free of the burden of military spending, they used the financial savings to invest in their people, creating strong public institutions including public higher education and universal health care. They have survived with safety and relative prosperity without a standing army. This film details the events over the decades in which the Costa Rican model has survived. Join us as we engage in dialogue and reimagine what that could look like in our communities. Screening followed by discussion facilitated by Michele Francis Ferris-Dobles, PhD Candidate, Department of Communication at University of Illinois at Chicago. For more info, please call 312-996-3095. All audiences are welcome to join us at this program. Captioning and ASL Interpretation services can be available by contacting the number above 5 business days before program.